﻿ Top 5 Social Media Marketing Tools » Red Mango Marketing! It seems like it should be pretty easy to make a Pinterest worthy masterpiece. But, even if you have all the ingredients, you can’t just start baking without the right bowl, spatula, measuring cups, spoons, mixer, and many other tools that you need. Right? Social media tools are like your baking tools. They make it easier to achieve your social media marketing goals. Choosing the right tools will add to the productivity, ease, and efficacy of your social efforts. You know that you want to be active on social media, but where do you begin? There are so many things to consider. You need to choose the social media channels where you want to be active, but how do you know where your potential customers are and what they are looking for? You need to create engaging content but how do you decide what kind of social promotions work best with your target, and how do you design a post or ad to spur them to action? You need to launch your campaign, but then how can you tell if it is working and whether you should continue? To get the right answers to all these questions, and more, you can leverage social media tools. You use a tool to discover what your target audience is looking for, and where. You can even see how your competitors are addressing this market demand. Once you determine your approach, you use a tool to design an impactful post, and another one to schedule this post at the right time. Finally, you switch to a measurement tool that will give you a detailed analysis of how effective your efforts were. What are social media marketing tools? Social media marketing is more than just creating and publishing content on social media platforms. It is a detailed strategy that lays out every single detail of making your social activities aligned with your business goals. Social media tools aim to make the process easier, faster, and more accurate. Let’s deep dive into understanding what social media tools are, what are the types of digital marketing tools you can use, and how each will boost your social media efforts. Acing social media marketing is all about sharing great content. But how do you know what people are looking for? Listening tools let you listen to what people are saying about your brand, across social platforms. You can monitor conversations about your brand, respond to comments promptly, and get real feedback to make your business strategies stronger. Discovery tools are research platforms for social media marketers. These tools allow you to uncover what’s trending on social media, and what people are talking about. You can use this information to create relevant content. If you are developing a social media post for the holiday season, you could use a discovery tool to see what types of posts your competitors are creating, and how are people engaging with them. Are they offering special promotions or incentives? Are they holding events? What is resonating with their audience? Using this information you can create targeted social media campaigns, and drive the desired action. While you may have figured out what you want to say through the discovery process, it’s not always easy to construct an engaging post or advertisement. Visuals play an important role in how people consume social content. Simply put – strong visual content makes people take notice. But, ‘visual content’ doesn’t just mean imagery. It’s the combination of all the design components that make up the complete post. When you’re creating an ad campaign on Facebook, every element that you choose — the image, the colors, the font, placement of the call-to-action button, all contribute to the effectiveness of your ad. When designing social media posts you need to follow the correct image size guidelines that are specific to each platform, keep the posts consistent with your brand colors, use powerful images that drive action, make the posts easy-on-the-eye, and impactful on the mind. Design tools for social media allow you to create dramatic visuals that will resonate with your audience. You can use these tools to resize images, add text to images, change the background, fonts, colors, borders, and make it look consistent with your brand. Depending on the design tool you choose, you may also have multiple template options to select from to create professional looking posts. One of the biggest challenges with social media marketing is creating engaging content, and ensuring that it’s sent out at the right time. To stay top-of-mind, and make an impact on social media, it is extremely important to be consistent and regular on your social accounts. Getting to know your target audience helps you set a voice, tone, look, and feel for your brand that best resonates with them. Then you can create a library of ready-to-go posts that can be used across multiple platforms. At the beginning of each month, create a detailed social calendar to support your overall marketing strategy, and stick to it. This will help you stay aligned with your social media goal, ensure you are regular with your posting schedule, and you have enough time to create the required content. Using a scheduling tool makes the process easier because you can schedule posts over a period of time and automate posting across multiple social profiles and platforms. Whether you’re a one-person marketing team or a group of people managing social activities, a social scheduling tool will make posting content a breeze. While every small business is trying to build a social presence, the problem is that many don’t know how to verify if it’s really working, or how to make it work. Measurement and analytics tools allow you to evaluate performance data to understand the impact of each campaign individually, and your marketing strategy as a whole. You can see how well your social media marketing efforts are working, and identify opportunities for improvement. Getting detailed reports on your social campaigns will help you know the best time to post, what to post, what works, and what doesn’t. Volume – Volume refers to the conversation size that your brand, or campaign, has generated. In simple words, you are measuring how much activity there is on social media, whether in posts, comments, tweets, etc. Reach – Reach measures how wide an audience you are impacting with your message. While it may be exciting to see your audience grow, reach alone is not meaningful unless people are actually engaging with your brand. Engagement – Engagement tracks the activity that your campaigns have generated beyond just being noticed. It can be measured by retweets, shares, likes, replies, conversions etc. After running multiple campaigns, you’ll get a better idea of what works with your audience, and make your future campaigns more targeted. While these are all campaign-specific metrics, you can also measure larger metrics like the size of your industry, the reach of specific industry trends, the most popular social platforms for your target audience, and many other metrics that make your social efforts more focused. You can use these tools to analyze the existing market, behavior, and potential. Using the detailed measurement and analysis reports you can tweak and strengthen your social media strategy. While creating good content, being relevant, and knowing what others are doing are all important — proper management of your social media activities tops the list. That’s where social media management tools come in. These tools are typically an all-in-one platform to manage your campaigns, social feeds, and other activities, across all social platforms. Because they combine the functionality of all the tools we have described above, they give you better control over your social efforts without having to log into multiple tools. For example, with a social media management tool, you can schedule and publish posts on Facebook, Instagram and your other social channels, measure how much engagement your posts are getting, see how people are reacting and quickly respond to comments, measure the direct impact on your business, and understand the trends within your industry. The feature sets vary across social media management tools. You will want to confirm that the management tool you select has all the functionality you require. However, you will find that all the management tools can be used across multiple social media channels. Small business owners are often pressed for time, wearing different hats to scale their businesses. Whether you are your own social media marketer or have someone doing it for you, a social media management tool will make it easier for you to get a complete picture of your social activities. Social media tools deliver the best results when you use multiple tools, in combination with one another. Using tools will boost the returns from social media marketing, and help you achieve your goals. Use the right tools to know what’s relevant for your business, create compelling content, and post it at the best time for your audience. Social media marketing involves many steps before your users see what you create. Ideating, strategizing, planning, creating, publishing, and measuring — each step becomes easier with the right social media tool. There’s a tool for every step of the way, make sure you’re achieving targets one step at a time. Whether you’re a social media marketing expert, or just starting, these tools will be your go-to solution to ace your marketing campaigns across all of your social media profiles. 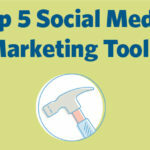 The post Top 5 Social Media Marketing Tools appeared first on Constant Contact Blogs. This entry was posted on Thursday, March 21st, 2019 at 8:53 am	and is filed under News & Updates, Social Media Marketing. You can follow any responses to this entry through the RSS 2.0 feed. Both comments and pings are currently closed.